Winter time around my house means sickness. We have 3 kids, one is in school full time. She's always bringing something home. We usually have a handful of colds in the winter and sometimes more. Using a humidifier during those times is important. When you have a cold, it's important to keep the nose and the throat moist so the nose can drain properly and so you don't get a sore throat. We just had a nasty cold, but we didn't have a humidifier. I thought having one for the boys room was the most important, so I contacted Crane. 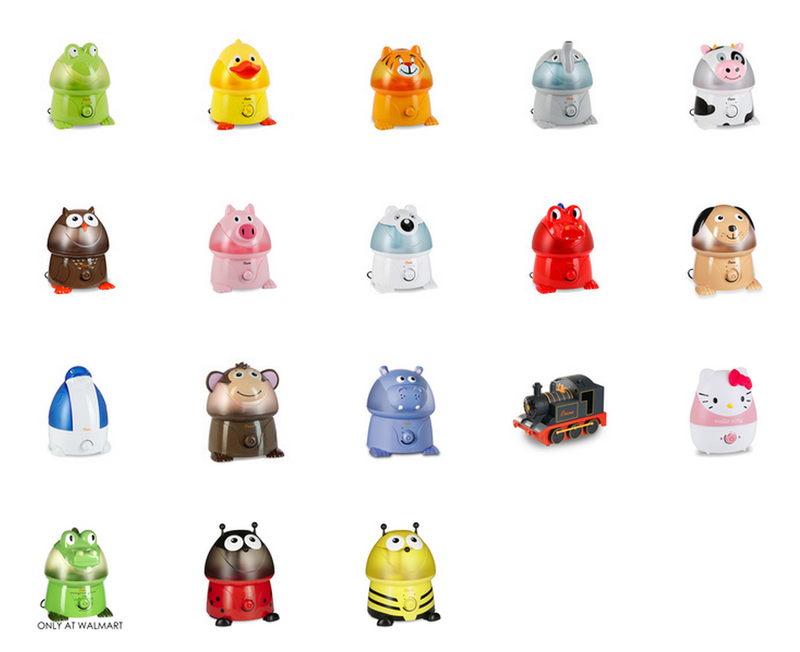 Known for their adorable animal humidifiers for kids. I was super excited to get my Elephant for the boys room! Super easy to set up! Just fill it with water, put on a dresser or shelf and turn it on! Make sure you use distilled or bottled water. The head comes off and reveals the water basin. The bottom of the water basin on the left, on the right is where the water disperses. This makes cleaning easy since the whole thing comes apart. Take the cap off the water basin and fill with water. Replace cap, set back on the base and you're ready to go. The elephant is super cute! I love that his trunk is the spout for the mist. It puts the mist higher up and into the air. Some I've seen have a spout on the front which means the humidity just falls to the ground, that's no good of course! Love that this aims it up. The humidifier is really quiet when it's running and it disperses the perfect amount so it doesn't soak everything, but works efficiently. The Adorable Humidifiers are cool mist, so feel safe knowing your child won't burn themselves. Humidifiers are known to relieve cough, cold and flu symptoms. It features a 1 gallon tank and can run for up to 24 hours on one single tank of water. When the water is empty it auto shuts off which is perfect. It does not require a filter and is more energy efficient than a standard 45w light bulb!! So it won't cost you an arm and a leg just to run! I also love all the cute designs it comes in!! Price: Each Adorable is $50! Overall: ***** Loving it so far! There is a giveaway for a Crane Adorable of your choice over here so check it out! My son would go crazy for the train humidifier! If I don't win I will totally have to buy that. These are so cute and I love that the mist comes out of the elephant's trunk. It seems like a functional way to incorporate the animal design. I it's adorable and think I would have to choose the elephant as well. it's adorable and I like the fact that it points up too. I like that it is a cool mist, so that it is safe and that it will run for 24 hours. Oh those are so cute! I would love one for Carters room too! Our house seems to be so dry this time of year too....and then with all the cold and germs coming home from preschool....this would help alot I think! I love the Prince Frog! These are adorable! I think these are great to add character to any room. These would be great for my family. We are in need of a new Humidifier. My daughter would love these in the animal shapes. I love to use a humidifier when my kids are not feeling well. Sometimes I run one just to put moisture in the home during the winter to keep our noses from the dry burning feeling. I really like that it shuts off automatically if the water runs out. Because I'm pretty forgetful at times! And all the cute animals don't hurt! I love the cute innovative designs, would look great in any kids room, can get any kid their favorite animal! I love these too, but I wonder about our hard water. Maybe I should put distilled water in there. they really do have a great selection of humidifiers, I love the teardrop design one for my 13 yr old's room and the animal ones are really cute for my grandsons room. With all the colds going around I agree it is important to have a humidifier going. These sound perfect for breathing easier, and they're so, so cute. These are so cute... I'm not a huge fan of the "industrial-looking" humidifiers for my kids' rooms. It's awesome that they don't need a filter and are easy to clean! We are just getting over colds, and we needed one of these so bad! We were actually running our rice cooker/steamer a few times a day to keep some moisture in the air! Love their cute designs, and that it shuts off by itself when the water runs out! We have the Frog humidifier for our 2 year old daughter. We all love it and are sure that she got through the winter with less colds because we put it on each night. I love these. They are adorable. The hippo is my favorite. I love they took a great thing and made it better with a shut off when the water runs out! This would be great to put in a child's room & so many adorable choices. I love all of the designs they come and in and I have heard all good things about them. Thank you for your review. Great post! I have been looking at Crane Humidifiers for a while now trying to decide whether or not to get one. I think I will after reading this post! We used to have the elephant humidifier for our daughter. They are very cute! I love that one tank can last up for 24 hours. When my daughter is sick the last thing I want to worry about is filling the humidifier every couple hours! dog is so cute and all new parents should have one great gift too. Yes. Me too. One of my favorite features of this humidifier is its cute design (I own a cow-shaped one). It's easy to use. Its price is not expensive. I'm plan to buy one more (a duck-shaped one) for my house. Haha. ~ Katy.